Just a few minutes’ drive from San Gimignano in the heart of Tuscany – with easy access to Pisa, Siena, Florence and the Tuscan coast, this wonderfully restored farming estate of over 200 hectares, has been owned by the noble Strozzi family since the Florentine period. It offers a wide selection of self-contained apartments with wide rural vistas to suit everyone's needs. Working with the finest craftsmen from across the region, twelve traditional old farmsteads have been lovingly restored and converted into tasteful, fully equipped and self-contained 1, 2 and 3-bedroom apartments, each with access to a swimming pool / barbecue area. Daily or weekly rates are available all year round. With quality accommodation and fittings, this is an ideal base for your family holiday, or for a group of friends, exploring Tuscany and nearby coastline. 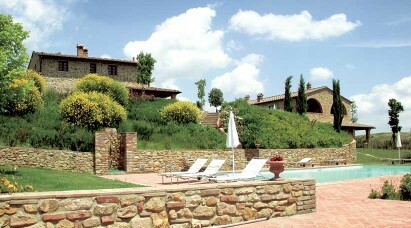 The twelve farmhouses on the estate are Tuscan Renaissance themed, combined with the comforts of modern life. The floors and ceilings in Tuscan ‘cotto’, the aged wooden ceiling beams and the furnishings create a warm and homely atmosphere. All apartments are provided with modern facilities including spacious bedrooms, modern kitchens, laundry facilities, en-suite bathrooms, quality bed linen and towels. Room servicing is available at an extra cost. 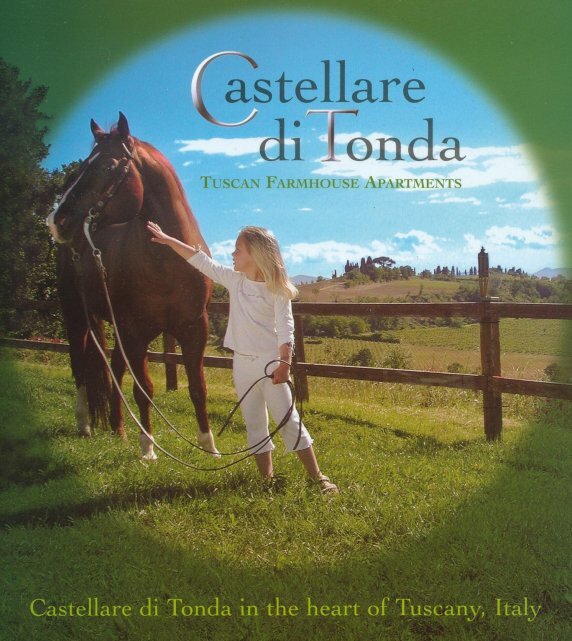 At 300 metres above sea level, Castellare di Tonda is set in a typical undulating hillside landscape. Within the estate there are plenty of activities and amenities available; a golf practise field, a fully equipped riding stable, massage and wellness centre, a beautiful landscaped lake for fishing and boating/canoeing, a traditional Tuscan restaurant, vineyards and wine tasting, olive groves and over 30 kilometres of walking or mountain biking trails within the estate. A professionally staffed children’s club provides a large indoor and outdoor play area and daily activities. Prices start from AU$1045 per week for a self-contained 2-room apartment - ideal for 2 adults & 2 children - which includes the use of the apartment and all facilities, heating/cooling, domestic appliances, cutlery/crockery etc, linen (changed weekly), water, gas, electricity, (non-fenced) swimming pool, BBQ facilities and public areas. Cleaning costs and activities are available at an extra cost. There is a small supermarket on the estate and nearby shopping if required. Long-stay discounts are available: Bookings for one week or more, which are paid in full at the time of booking, are eligible for a 7 nights for the price of 6 nights discount offer (not applicable to the High Season). Outdoor Travel is the booking agent in Australia for this wonderful accommodation centre right in the Pisa, Florence, and Siena heartland. Our staff have stayed there so do call us if you have any questions. Once you have entered the gates of the property you will be surrounded by the relaxed scenery of the Pietrafitta farmstead. Recently restructured, the building offers every comfort and enjoys a privileged position with a beautiful view of the lake where wild animals – including deer - can be seen at sunrise. 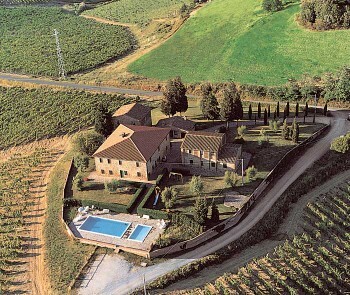 Enclosed by walls, Casanuova is in a prominent position dominating the surrounding valleys and vineyards. Its cypresses and leafy trees in the garden provide a shade on hot summer days. An old village dating back to the first half of the 19th Century, the Casanuova farmstead complex is composed of two, three and four-room apartments. There is an unfenced swimming pool for adults, another for children and also a small play area. There are three separate units, a swimming pool for adults and one for children, as well as a children's playground. From here, at sunrise, you may watch deer, mouflons (a type of wild sheep) and other wildlife coming out of the wood on the grounds nearby. Fornace lies 200m away from the main complex and it is made up of three separate buildings. The apartments are really the most exclusive on the estate offering all the comforts that you would expect. Thanks to this central position, the estate's main reception area, restaurant, mini-market, church and bar are just a short walk away. A double line of cypress and fruit trees leads to this farmstead where one can enjoy a beautiful view of the surrounding fields and of the thick vegetation with the oldest holm-oak tree on the estate. In the middle of a spacious clearing shaded by trees is a large swimming pool for adults, one for children and, just a short distance away, a tennis court with synthetic grass. Situated in a small farmstead grouping at the edge of the estate perhaps the furthest from the main reception area. Beside the practice golf course and putting greens this accommodation is always popular. A line of cypresses leads to the farmstead called Palazzina with just six apartments. From the top of this hill you can enjoy a stunning view taking in the surrounding vineyards, woods and valleys. The air here is fresh and on clear days you can see as far as the Tuscan coast (about 60 minutes drive away). The swimming pool offers complete relaxation in a beautiful location surrounded by open meadows, fig trees and vineyards. with a feeling of seclusion, Palazzina is only a few minutes walk from the tennis courts and the restaurant. In an island of green lawns, these well located yet secluded apartments, will allow you to sunbath whilst admiring the wonderful Tuscan landscape. The swimming pool overlooks the wildlife reserve, where at dawn and dusk you may even catch sight of mouflons (wild sheep), fallow and roe deer, crested porcupines and even badgers. The Estate's lake is also just a short walk away. From its truly unique position on a prominent hill, the Redine farmstead offers visitors a breathtaking view of the woods that frame the surrounding valleys and hillsides. Enjoy the stunning colours at sunset right down to the coast. A swimming pool and children's play area are located beside the apartments. For those looking for peace and quiet, this farmstead is composed of only two apartments, each with three renovated rooms. Secluded and with its own private swimming pool, there are splendid views of the nearby woodlands on the edge of the estate. The restored farm buildings are divided into three apartments perched high on a natural terrace overlooking the valley. There is a swimming pool, a children play ground and, just a few step away, the all weather tennis court and stables. The Aietta complex is located on slightly raised ground among the hills of the Chianti just a short distance north and east from the main Estate. Framed by olive trees and productive vineyards, these former village buildings have been wonderfully restored in the architectural style of the mid 19th Century. The swimming pools for adults and children overlook the valley, tennis court and the children’s playground. Here horses are the owners passion. The fully equipped and well-appointed Riding School and Stables - run by a team of professionals - has a stud farm with purebred Quarter Horses, a comfortable club house, indoor ring, breeding area and two arenas (one covered of 50 x 26 metres and an outdoor training arena of 30 x 50 metres). Rides (both inside and outside the estate) are available daily. Riding classes for beginners (including children's classes) with multi-lingual instructors can be arranged offering the maximum in competence and safety. The Estate breed and train horses in many other disciplines. Full day guided horse-riding excursions can be arranged as can a half-day or a couple of hours. Take a short ride to the lake for a picnic or ride further to discover ancient Etruscan ruins and a host of Tuscan wildlife. The restaurant is open for guests and visitors in the evening from 7.00pm onward, and lunch from 1.00pm during holiday periods. The restaurant serves a variety of reasonably priced hot and cold dishes including traditional Tuscan pastas and soups. A highlight of your stay, guests may join in with a traditional Tuscan cooking course - with the pleasure of tasting all the food you prepare. Group or specialist cooking courses, banquets and special dinners are available on request.